The GandCrab 3 virus is the latest iteration of the GandCrab family of threats. It uses the same .CRAB extension to encrypt target user data and extorts the victims for a ransomware payment. The new iteration can be customized further by the hacker operators, its modules can be set up according to the ongoing attack campaign. It is expected that several attacks will follow in the coming weeks. 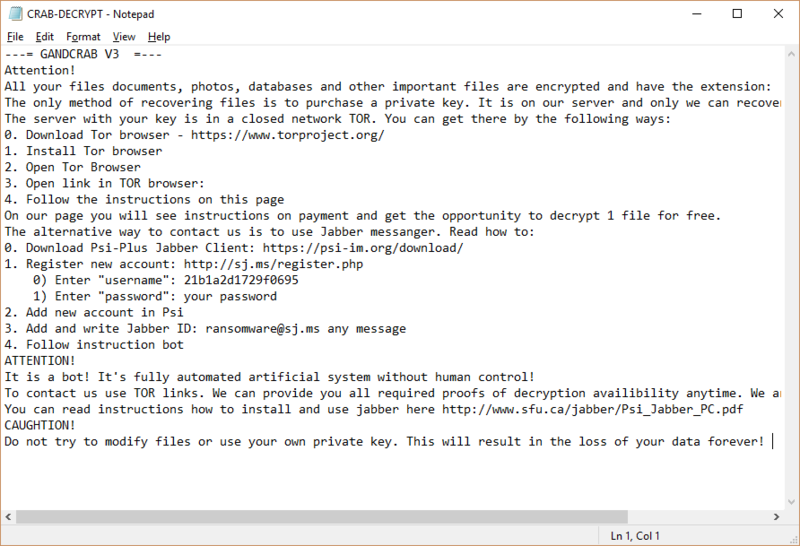 Short Description The GandCrab ransomware encrypts sensitive information on your computer system with the .CRAB extensions and demands a ransom to be paid to allegedly recover them. User Experience Join Our Forum to Discuss GandCrab 3. The Gandcrab 3 virus threat as the new version of the malware family uses a variety of dangerous tactics in ordere to infect computer users worldwide. It is presumed that the primary attack methods used remain. The criminals send out bulk spam messages that utilize social engineering strategies that coerce the recipients of interacting with the malware elements. The virus files may be either attached directly or hyperlinked in the body contents. The messages can also help deliver payloads as a secondary delivery mechanism. The first type is the inclusion of the malware code in software installers. They are made by taking the legitimate files from the official download pages and inserting the code in the resulting installers. Targets can be any popular software such as utilities, creativity apps or computer games. As soon as they are installed on the victim machines the Gandcrab 3 virus is started. The other payload is the inclusion of the initial infection engine in documents. They can be of different types such as text files, spreadsheets or presentations. When they are opened by the users a notification prompt appears that asks the victims to enable the built-in scripts (macros). If this is done the infection is started. Gandcrab 3 can be distributed using browser hijackers — dangerous web browser plugins that have been created by the developers. They are advertised as providing useful functions to the target browsers and are usually made compatible with the most popular applications: Mozilla Firefox, Safari, Microsoft Edge, Opera, Internet Explorer and Google Chrome. The main goal is to redirect the users to a hacker-controlled site by changing the default settings: new tabs page, search engine and home page. The next step is to load the files onto the victim host. Web scripts can be used to deliver the threat to various sites. Examples include pop-ups, notification screens, banners and redirects. Through affiliate links they can also be inserted onto legitimate and well-known sites. Update May 2018: In the end of May 2018 there has been a significant rise in the attacks. Targeted GandCrab infections have been spotted in South Korea. It appears that the root of them is a massive email campaign that takes several forms — from fake delivery notifications to local HR recruitment announcements. The security reports indicate that the RIG exploit kit is responsible for the vast majority of detected infections. The GandCrab 3 is a new strain of the GandCrab malware family. According to the security analysis it uses a strong encryption engine in order to encrypt the target data following the usual ransomware behavior strains. The analysis shows that the main engine has the ability to be changed with each target campaign. The infections can begin with the start of a data harvesting component. It is programmed into harvesting strings that can be grouped into two main groups. The first one is related into acquiring information used for the campaign analytics as well. Example data includes hardware information and certain parameters set by the user in the operating system. The other data can directly expose the users identity and is classified as personal data. Such information includes the following: name, address, telephone number, geolocation, interests, passwords and account credentials. The collected data can be fed to a stealth protection component. It uses the available information to search for installed applications and system services that can intefered wit the correct execution of the virus. Examples include anti-virus products, sandbox environments and virtual machine hosts. In certain cases the malware can be configured into deleting themselves if they are unable to do so. This is done in order to evade detection. After the initial modifications have been made the GandCrab 3 virus can proceed with various system changes. The typical goal is to make the infection a persistent threat meaningthat the victims may find it very difficult or even impossible to remove the virus with manual methods. A common way is to make changes to the Windows registry where modifications to user-installed software or operating system services can cause applications or certain features to stop working properly. Depending on the magnitude of the changes overall system performance can be affected. The persistent state of execution of GandCrab 3 can be achieved by making it run every time the computer is started. An additional measure is the removal of the possibility to enter into the recovery menu. If programmed in a suitable way GandCrab 3 can also institute a powerful network connection to the hacker-controlled servers. This is used to deliver additional malware in a Trojan like manner, as well as spy on the victim users and take over control of their machines at any given time. Like other strains of the GandCrab malware family this third iteration can be customized to include further plugins. To contact us use TOR links. We can provide you all required proofs of decryption availibility anytime. We are open to conversations. Do not try to modify files or use your own private key. This will result in the loss of your data forever! If your computer system got infected with the GandCrab 3 ransomware virus, you should have a bit of experience in removing malware. You should get rid of this ransomware as quickly as possible before it can have the chance to spread further and infect other computers. You should remove the ransomware and follow the step-by-step instructions guide provided below. Threats such as GandCrab 3 may be persistent. They tend to re-appear if not fully deleted. A malware removal tool like Combo Cleaner will help you to remove malicious programs, saving you the time and the struggle of tracking down numerous malicious files. Threats such as GandCrab 3 may be persistent on your system. They tend to re-appear if not fully deleted. A malware removal tool like SpyHunter will help you to remove malicious programs, saving you the time and the struggle of tracking down numerous malicious files. Note! Your computer system may be affected by GandCrab 3 and other threats. SpyHunter is a powerful malware removal tool designed to help users with in-depth system security analysis, detection and removal of threats such as GandCrab 3. 1. Install SpyHunter to scan for GandCrab 3 and remove them. 2. Scan with SpyHunter, Detect and Remove GandCrab 3. Ransomware infections and GandCrab 3 aim to encrypt your files using an encryption algorithm which may be very difficult to decrypt. This is why we have suggested several alternative methods that may help you go around direct decryption and try to restore your files. Bear in mind that these methods may not be 100% effective but may also help you a little or a lot in different situations. Note! Your computer system may be affected by GandCrab 3 or other threats. Remove GandCrab 3 by cleaning your Browser and Registry. Fix registry entries created by GandCrab 3 on your PC. Combo Cleaner is a powerful malware removal tool designed to help users with in-depth system security analysis, detection and removal of threats such as GandCrab 3. Step 5: In the Applications menu, look for any suspicious app or an app with a name, similar or identical to GandCrab 3. If you find it, right-click on the app and select “Move to Trash”. Step 6: Select Accounts, after which click on the Login Items preference. Your Mac will then show you a list of items that start automatically when you log in. Look for any suspicious apps identical or similar to GandCrab 3. Check the app you want to stop from running automatically and then select on the Minus (“–“) icon to hide it. Remove GandCrab 3 – related extensions from your Mac’s browsers. A pop-up window will appear asking for confirmation to uninstall the extension. Select ‘Uninstall’ again, and the GandCrab 3 will be removed. When you are facing problems on your Mac as a result of unwanted scripts and programs such as GandCrab 3, the recommended way of eliminating the threat is by using an anti-malware program. Combo Cleaner offers advanced security features along with other modules that will improve your Mac’s security and protect it in the future. hey i am affected by GnadCrab 3, all my dat has been encrypted. I have followed your steps and tried to remove it from the root,but still i am not able to get restore my encrypted files back,please do help me..
At the moment there are no decryptors available for this particular strain of GandCrab. If you have been able to recover your files and used the anti-spyware solution in our instructions then you should not worry about the infection. Our detailed description of the virus’s behaviour and the necessary removal steps should help you take back control of the infected machine. Remember that you need to run the software in the particular order: first the anti-spyware program needs to remove the virus code, after that the data recovery tool can help restore your files. Hallo Martin, gibt es Stand 28.05. einen Decryptor für Crandcrab v3? Hola!! Se acaba de infectar mi notbook con GandCrab v3, pero estaba recien formateada la pc. Cuando quiero volver a formatear para instalar el S.O de nuevo, no me permite bootear ni entrar al setup. Que puedo hacer??? Agradeceria toda ayuda…!! Alguna solución para restaurar archivos encriptados con Gandcrab v3.?? Hey !, I found this information for you: "Remove GandCrab 3 Virus — Restore .CRAB Files". Here is the website link: https://sensorstechforum.com/remove-gandcrab-3-virus-restore-crab-files/. Thank you.